Inspired in part by a Neiman’s Idealist post (see my super-long comment) and a green beauty collab I somehow missed out on (see the collab master list), I’m bringing to you part one of my “natural beauty product staples” series in which I name products I constantly repurchase no matter what. You’ll probably recognize a few from past posts, Instagram love or gushing comments and recommendations, but I wanted to embark on a series like this because as a beauty blogger, I tend to fall in love with a LOT of products. But as we all know, money talks — which products do I buy over and over again once the PR sample is gone? Time to keep it real, ladies. It’s well-documented that I’m a lip balm junkie. Despite my overflowing soup bowl of lippies, there’s one balm that I go a little nuts without: Dr. Hauschka. It’s the perfect texture — creamy, smooth and thick — without being too overpowering and slick for a layer of lip color on top. Though there are so many other lovely lip balms out there, Dr. Hauschka is easily accessible at my local Whole Foods, which means it’s that much easier for me to repurchase it again and again. Since first reviewing this back in November, Zum Rub Moisturizer in Frankincense & Myrrh has experienced an incredible jump in sales and stock prices. OK, maybe not (and if so, I take full credit! ), but I’m trying to illustrate how much I preach this stuff. It soothes irritation from acne breakouts and can even eliminate cysts (that was my experience!) with a small number of natural ingredients. I know my girl Neiman’s Idealist is wary of shea butter on acne-prone skin, but seriously, you just can’t knock this stuff until you try it. Anything that zaps my cystic acne outbreaks in three days (compared to the normal weeklong or more run) gets props — and repurchases — in my natural beauty (check)book. Jojoba oil ignited my love for facial oils. As we all know by know, jojoba oil’s properties are most similar to our own natural sebum (aka facial oil), and while so many other oil-cleansing products have hit the market, I always keep my trusty bottle of jojoba on-hand. While I used to just grab whatever jojoba was cheapest at Whole Foods, I now prefer Aura Cacia’s organic jojoba oil — which is usually on sale! I love the slightly nutty smell, the USDA organic seal and the pretty packaging on Aura Cacia’s skin care oils. I’ve yet to do a standalone review on this miracle hydrosol, but here’s the mini-review: I’d never tried anything from Evan Healy, but had heard so many good things about her hydrosols. (A hydrosol is incredible floral water — get the details here.) I chose this particular concoction after some quick research on immortelle’s acne benefits. I bought a trial size of the immortelle hydrosol (full sizes weren’t available at The Merc, a co-op in Lawrence, Kansas) about a month ago and used it religiously, every day, twice a day. Long story short, the entire month I used this hydrosol, in combination with Zum Rub at night, I had zero major breakouts. None. Zilch. Seriously. It was the best skin month ever, and I’ve been longing for another trip to The Merc (going this evening!) to stock up on several bottles because my local Whole Foods doesn’t carry this particular hydrosol. Since running out of this hydrosol, I decided to try Evan Healy’s Lemon Thyme Facial Tonic Hydrosol in hopes of getting the same result. No cigar, as in, I have five major blemishes on my face right now compared to zero last month. This evening can’t come soon enough! Some people have issues with switching to sulfate-free, natural shampoo — or with just switching shampoos in general. I’m lucky that my hair is pretty cooperative with whatever I feed it and I have very few issues (cowlicks, long dry time, etc.) to deal with. I just need a good, clean shampoo that can boost a bit of volume to my fine strands and invigorate my dry patch-prone scalp. We all talk about how every hand lotion we love doesn’t leave your hands greasy and makes them feel so silky smooth, but I’m for real when I say that about this hand and nail cream. I use it in the morning and at night, and typically keep a travel size in my purse. I like the light, fresh scent and the fact that I can apply this and get back to work without allowing it to dry or continually having to rub my hands together. Primavera is a natural spa brand, and I’m lucky to live within walking distance of a fine natural spa that carries this line — makes it very easy to repurchase again and again! 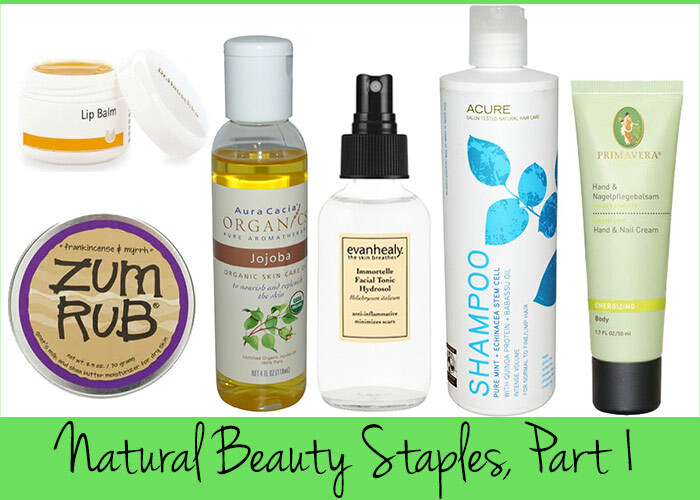 What are some of your natural beauty staples? Why do you love them? Tell me in the comments section!